Why do females in male-philopatric species seem to show larger variation in their life history strategies than males in female-philopatric species? Why did females in human societies come to show enormous variation in the patterns of marriage, residence and mating activities? To tackle these important questions, this book presents the latest knowledge about the dispersing females in male-philopatric non-human primates and in human societies. The non-human primates that are covered include muriquis, spider monkeys, woolly monkeys, gorillas, chimpanzees, bonobos and some species of colobine monkeys. In these non-human primate species females typically leave their natal group before sexual maturation and start reproduction in other groups into which they immigrate. However, there is a large variation as some females may breed in their natal group with some risks of inbreeding with their male relatives and some females may associate with males of multiple groups at the same time after leaving their natal group. Such variation seems to provide better strategies for reproduction depending on local circumstances. Although knowledge about female dispersal patterns and life history is indispensable for understanding the dynamic structure of primate societies, it is still not known how females behave after leaving their natal groups, how many groups they visit before finally settling down and which kinds of groups they choose to immigrate into, due to the large variation and flexibility and the difficulty of tracking females after natal dispersal. 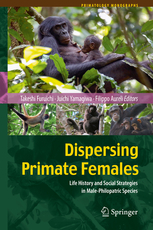 To encourage further progress in this important field, this volume provides new insights on evolution of female dispersal by describing factors influencing variations in the dispersal pattern across primates and a hypothesis for the formation of human families from the perspectives of female life history. This book is recommended reading for researchers and students in primatology, anthropology, animal behavior and evolution and for anyone interested in primate societies and human evolution.